Harmony keyboard tray: Mousing surface can be positioned on the right or left, and rotates forward up to 20°. Anti-skid pads hold keyboard in place. 23" wide (32" wide with mousing surface extended) x 12.3" deep. Gel-like foam snap-in palm rest. Tray is black and composed of ABS plastic. 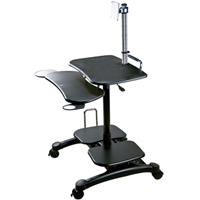 The PopDesk Mobile Computer Desk from Aidata is a wheeled sit-stand desk made of high impact ABS plastic and designed for both home and office use. This model will house one CPU tower, one VESA compatible monitor, one keyboard and mouse, and has one elevated worksurface for documents, making this mobile desk a complete height-adjustable sit-stand workstation for users 5' 8" and under. The pneumatic lift (gas cylinder) makes up and down adjustment easy and effortless. The additional worksurface between keyboard and monitor gives extra space for documents or other work items, while the keyboard tray includes both a swingout mouse pad and a cup holder. 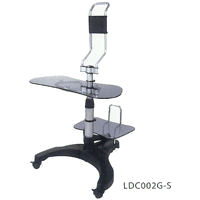 The caster wheel set is lockable, so that the desk safe and sturdy when locked. 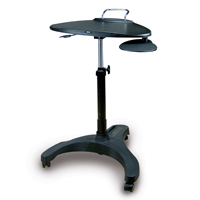 The larger casters ensures that the PopDesk moves well not only on hard surfaces but even low pile carpet. Simple assembly required. The PopDesk from Aidata is a mobile notebook desk made of tempered safety glass and designed to fit notebooks up to 17". 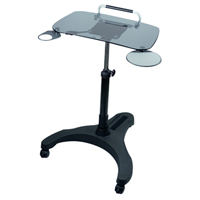 It has a retractable mouse platform, cup holder, and durable polypropylene plastic base (3 lockable casters and power bar slot). It can be knocked down, flat-packed and easily assembled. The PopDesk from Aidata is a mobile notebook desk made of high impact ABS plastic and designed to fit notebooks up to 17". 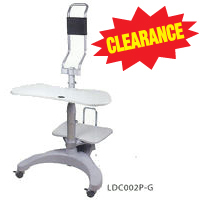 It has a retractable mouse platform and durable polypropylene plastic base (3 lockable casters and power bar slot). It can be knocked down, flat-packed and easily assembled. The Notebook Cart from Aidata is a wheeled sit-stand desk made of high impact ABS plastic and designed for both home and office use. 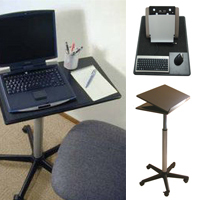 This model will accommodate any size notebook or laptop, making this mobile desk a suitable notebook or laptop workstation for users 5' 8" and under. The pneumatic lift (gas cylinder) makes up and down adjustment easy and effortless. The keyboard tray includes both a swing-out mouse pad and a cup holder. 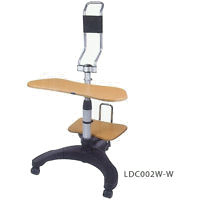 The caster wheel set is lockable, so that the desk is safe and sturdy when locked. 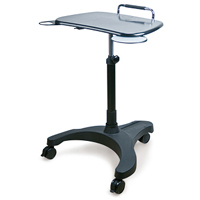 The casters are large enough that the Notebook Cart moves well not only on hard surfaces but even low pile carpet. NOTE: Simple assembly required. 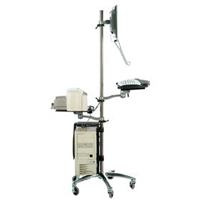 The LCD Mobile Workstation from Aidata offers exceptional portability, allowing you to mount an LCD monitor, and store CPU, keyboard, and mouse all on one convenient, fully mobile unit. The stand has a stylish, yet practical design, including height adjustable trays for keyboards/mouse and mount for an LCD monitor (up to 20"), easy to grab handles, and locking wheels. Constructed from 8mm safety glass. Constructed from 15mm MDF board (medium density fiberboard). 3 colour selections: grey, black or wood.